lorious sunshine beats down as I sip my tiny cup of treacly, rocket-fuel expresso coffee. An excitable gabble of Italian breaks out as a group of lads play footy nearby, and the waft of frying garlic creeps into my nostrils. For one delicious moment I'm in a cafe in the town square of one of those beautiful, terracotta-coloured, hilltop villages in Tuscany. Then the broad Lancashire accent of George Fogarty, Carl's dad, jolts me down to earth. I'm in the Donington Park paddock, where I'm spending a bank holiday World Superbike weekend. George ambles over to the food bar and is served a platter of pasta. He's joined by Michaela, Foggy's wife, and their two children, Danielle and Claudia. It's a family affair. The Friday morning practice session - the first for this third round of the championship - starts in about half an hour, but the Ducati starts in about half an hour, but the Ducati Corse World Superbike team seems wholly unconcerned. Foggy joins team boss Virginio Ferrari and the group of mechanics playing football next to the Ducati encampment. The handsome, diminutive Virginio (an ex-Formula 1 racer) wanders over and joins me for a coffee. He's so laid back and friendly it's hard to believe he runs a championship-winning team that's dominated the series for six out of the last nine years. He casually describes what he admires most in our Foggy: "There are a lot of other racers who are as fast or even faster that Carl over ten laps, but what's important is that a racer remains utterly determined throughout the year. He has to be angry with himself. Carl is. "There aren't many riders like Carl. He's one of the few with the complete determination to win, and he wants to keep on winning. Perhaps Aaron Slight and Scott Russell are the same." As the minutes tick towards the practice session, I ask Virginio about his fiery relationship last year with that temperamental little ex-250 GP champ, John Kolinsky. "I gave him my heart and soul," he sighs. "He had Ducati's full backing, but he behaved badly. The team is more than just the rider, and we all have to enjoy life. There's more to it than just racing. I love to see someone who reflects on life, who cares about what they do. And if you're a sporting hero, you carry a certain responsibility." Cool. Only a few minutes to go. Without a word, the football stops. Virginio and I walk over to the Ducati garage. The place is immaculate; Foggy's bikes gleam under neon lights, technicians mill around. The man himself glides in, Oakley shades on his head, steely-blue eyes slicing through everything (including me). He sits in a black, fold-up chair reserved exclusively for him, signs a couple of autographs like an automaton, and ignores the camera lenses pointing at him. Blonde Michaela wafts into the garage in a translucent pink miniskirt and a white, figure-hugging top - still Foggy doesn't stir. Not so the mechanics, who try to get her to stand right above a concealed compressed air hose. She doesn't fall for that one, so they chase her with the hose anyway. The action really starts after Foggy's roared off for his first few laps: Michaela has to gaffer-tape her skirt to her legs. I join her and Foggy's mechanic, Anthony 'Slick' Bass, on the pit lane wall, where Michaela notes the lap times. "What else do you do for Carl?" I ask. "Ha!" she laughs. "Feed him, wipe his arse, you know, the normal things. Yes, I do worry about him when he's out, so team work like lap timing helps take my mind off it. If I thought about it too much, I probably wouldn't be here." Foggy's first times are not good. Troy Corser set the record of 1 min 33 last year, and Foggy is doing 40s, complaining about the rear end. The team has problems with mid-corner grip. Foggy pits and jumps onto his number two bike, which has a heavier flywheel. This stops the power coming on and shutting off too quickly, and might cure the problem. While he's out the Ohlins man changes the shock on bike one and the mechanics blow every speck of dirt off it with the air hose. The team is fantastically efficient. Everyone has a specific role, no orders have to be given. Virginio confers with the telemetry men, then strolls over to look at times on the garage telly. Honda's Aaron Slight has set fastest lap with a 1min 35.097. Foggy's down in fifth. He does two more laps before returning with front end chatter, although the rear is behaving better. He sets off again on bike one. Lap times chop and change continually. By lunchtime Foggy’s up to second, behind arch-rival Slight. The two Friday test sessions are vital. They’re the only chance before the next day’s timed practice to decide on tyres (Foggy tries out at last three sets per session), suspension settings, gearing, steering head angles and rear ride height. Only the telemetry men know exactly what’s happening on the bike, and a meeting ensues to discuss the first morning’s activity. Soon Foggy’s back out, and things hot up. Every time he pits, Michaela cleans his visor while he takes a drink of water. His outings are punctuated by discussions with the Michelin and Ohlins men, and mechanic Slick. Virginio keeps a back seat, so I will stay well out of the way. While the stench of grease, fuel and exhaust fumes hangs round the pit lane, the Ducati garage is kept utterly spotless. The pressure on Foggy must be intense; the entire team’s efforts rest on his shoulders. Half way through afternoon practice Pier-Francesco Chili leaps to the top of the leaderboard, with Foggy second and Slight third. Suddenly Foggy demotes Chili to second place, then Slight pips them both with a 1min 34.768. The 16.5 inch rear wheel the team is trying is swapped for a 17-incher, and the rear ride height is lowered to improve tyre life, though this slows down steering. Out of the blue, Niall Mackenzie leapfrogs up to second, with Foggy in third and Chili fourth. Tension mounts – there’s no more larking around, and Michaela’s skirt doesn’t get a look-in. By the end of play Foggy is not entirely happy. He’s third fastest, but reckons he could go half a second faster if the bike was set-up better. Saturday testing doesn’t bode well either. Foggy must perform to take the series lead from Kocinski. But despite every effort, he ends the day third fastest, behind team-mate and pole position man Hodgson and Slight in first. Kocinski’s ninth. Sunday morning, and the pit-lane warning siren goes off, signalling the rain-hit start of the third morning’s practice. The mechanics fire up Foggy’s bike with a device that looks like lawnmower engine with a rubber drive wheel, pushed up against the Ducati’s rear tyre. It’s quirky but it works every time. The game of lap time catch-up continues, but the drenched track ensures it won’t make any difference to yesterday’s grid positions. James Whitham on his GSX-R Suzuki sets fastest time as the track dries out. 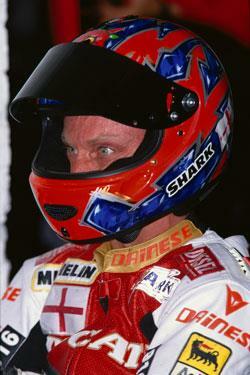 Then Chili overtakes Whitham, then Foggy takes fastest time with a 1min 42.896. As the session ends, pole position man Hodgson is trailing tenth fastest. Slick Bass and the Michelin man confer in a huddle, and Virginio (the only smiling face in the garage) talks to the telemetry boffin. Foggy complains that there’s a dry line, but it’s not his. A sea of faces laps at the garage doors as the race fans’ paddock walkabout starts, but all understand the unwritten rule not to enter. Foggy sits in his chair, staring into nothingness, ignoring the hordes of punters. The pit lane clears, the siren goes off for the second time, and Foggy’s first onto the track. This is the big one. No more practice. As more bikes roll onto the grid they disappear under a mass of umbrella girls, photographers, mechanics, TV crews, white-suited marshals and important-looking officials. There’s a brief silence except for the unintelligible drone of the commentators. The speakers blare out a tinny rendering of God Save the Queen and the siren sounds again to clear the track. For the first time in ten minutes the bikes are exposed. Seconds later there’s a mechanical bellow that could have come from the bowels of the earth, and the riders begin their warm-up lap. The race starts well. Foggy leaps into the lead, followed by Chili and Hodgson, a Ducati one-two-three. The 19-strong Ducati team are glued to the garage telly. Outside, Michaela dances for joy on the pit lane wall as her Carl zooms by in first place. Then it’s Hodgson’s turn to grab the limelight, then Chili’s. Meanwhile a stealthy Slight, a man on a mission, makes up ground on the leaders with every lap. He retreats into a sullen mood, but I risk a question. Wrong decision. “What happened?” I enquire. “Came second, didn’t I?” he snaps. I look at Foggy’s haggard face and suddenly see the years of stress written in it. To my amazement the Foggy family joins in the team lunch. So even superstars can relax in the lull of a battle. I chat to George, who’s full of tales of past racing. He’s ace. When Roger Burnett, Neil Hodgson’s manager, joins in we have a proper little party. But by mid-afternoon we’re glued to the second race on the garage telly again, monitoring Foggy’s every move. There’s a groan as Kocinski gets the holeshot off the grid, and a sigh of relief as he drops back. A determined but horribly ragged Chili nearly highsides, and Michaela’s screaming at her husband to get a move on. The tension mounts as Foggy pulls away slowly from a pursuing Honda, but Chili’s back up front. Finally Foggy gets into the lead and starts to build up a cushion; he’s the only man circulating in the 1min 34s. But nothing is taken for granted, until Chili takes Slight right at the end. Then there’s an enormous roar as Foggy’s first past the chequered flag, and grabs the series lead from Kocinski with his 40th World Superbike win. Virginio’s ecstatic, there’s hugging going on all around, and everyone jokes and laughs. He grins like a Cheshire cat when he’s presented with a trophy for being the greatest World Superbike rider ever. He’s human after all. As the team swiftly and efficiently decamps, I feel a little sad. The atmosphere has roller-coasted from highs to lows and back again, and I don’t want it to end. I savour one last espresso. When I first met Foggy he seemed surly, single-minded. Then he turned into a grinning schoolboy. Now he’s my superhero. Foggy and Neil run different set-ups. Carl leans further but brakes less aggressively, so prefers softer forks Neil goes in really hard, and is often quicker than Carl mid-corner, but exits more slowly. Lardy Neil needs a harder rear spring too. This year’s mods to the Ducatis: stiffer, lighter forks with magnesium bottoms, a stronger headstock, a thicker cylinder wall for the 996 motor, new cylinder heads, a larger sump, better engine lubrication and a lighter, single-sided swing arm. The team is 19, plus two riders. That’s a cook, general dogsbody, drivers, mechanics, engineers and telemetry experts. Also on hand are Michelin tyre experts and an Ohlins man. The Japanese factories are either too proud or too inexperienced to build a Ducati-thrashing twin. Suzuki’s TL1000 has the poke but lacks a 916’s aerodynamics and steering finesse; Honda’s VTR1000 would need a total frame and engine revamp to cut it on a race track. Foggy wears the same green T-shirt for every race. Ducati pays for almost all the team, but aren’t above the odd bit of world class blagging from Agip oil, Michelin tyres, Brembo brakes, DID chains, Usag tools and Corgi. Carl wears a gold No.1 ear ring in his right shell-like. At 40 wins, Carl’s won more World Superbike races than anyone else. Second is double champ Doug Polen, with 22.